The Sons Of Liberty - A power from without or a power from within? 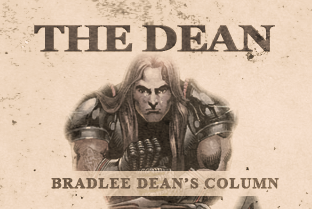 Home - The Dean-A power from without or a power from within? As I search the events taking place across America today, it is interesting to note how many un-American, ungodly, and unconstitutional activities are being promulgated or endorsed by this current administration. If it is not to advocate what God clearly condemns (this last week Scott Anderson became the first homosexual in America to be ordained by the Presbyterian Church), then it is some form of unconstitutional “gun-walking scandal” such as Attorney General Eric Holder’s now famous Fast and Furious. One has to ask themselves, what is the fruit of this lawlessness? And who eats the pill? As I have done over 330 high school assemblies in this country in over 22 states, one of the things I have noticed is that the schools have now become testing and training grounds for a monitored police state. Through man’s ten thousand commandments (all in the name of “safety” and “security”), you now have fences around the schools, metal detectors before entering school buildings, surveillance cameras, and even armed guards - all because there are those who want to see what happens when you dare God’s justice by departing from His Commandments.